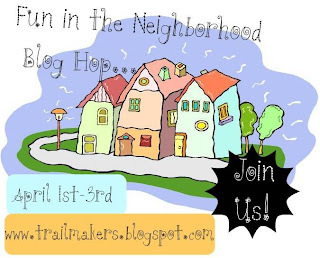 sandileescraps: Fun In the Neighborhood Trail Makers Blog Hop! Fun In the Neighborhood Trail Makers Blog Hop! In case you get lost, here's the links! And the main dish at Sandi's ... you are HERE!!! Then come back here, become a follower (if you aren't already)and tell us what you liked best about the Fun in the Neighborhood Blog Hop for a chance to win an April 2011 The Paper Trail Kit (retail value $35). WOWsers!!! That's going to be one lucky winner! 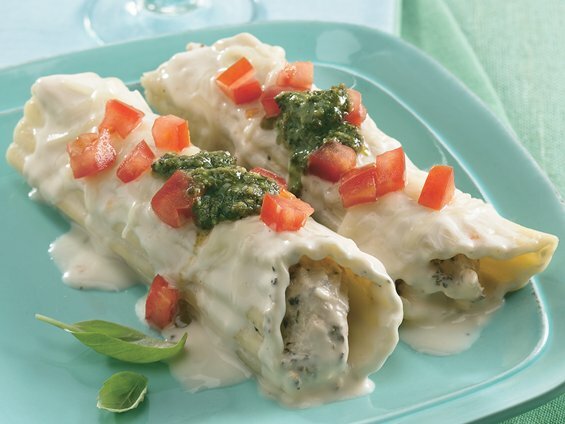 So glad you stopped by for the main dish...pesto chicken manicotti! You can find the recipe here if you want. I got my inspiration from the idea of filling the manicotti with something and also the ridges in the manicottis. I made it using 3 of Krisi's Kreations pillow box small templates and from her accordion flower. Krisi is our sponsor this month at Trail Makers. I altered the directions from the pillowbox bucket at Splitcoast Stampers, but it basically goes together the same way to make this basket. I will make another one and have the exact measurements for you later this week. I just don't want to tell you wrong. Some hints when making the accordion flower...have patience (LOL!) I had a piece of scrap paper covered in 4 pop dots to lay the flower down onto, so it will stick and stay. This one isn't perfect, but I think it adds some character. To get my texture on my brown cardstock I used my Big Shot and embossing folder. This is the Pillow Box template I used. And here is the accordion flower template I used. Don't you just love that Crate paper Neighborhood collection that is in April's The Paper Trail Kit? The papers are just so versatile! Can't wait to play with more of them! You know these will be great for spring, Easter, rainy days and also everyday photos. I love when I find paper like that! April 2011 Kit includes 8 Crate Paper Neighborhood DS patterned papers, 4 sheets Bazzill cardstock, Crate Paper Neighborhood alpha stickers (12x12), Border stickers, trims, and buttons. Plus, Prima felt embroidered flowers, Prima birds, and a package of Bo Bunny Double Dot Chipboard Swirls and alphabet. Hope you enjoyed your main dish. I am giving away an RAK if you become a follower of mine (you'll get 1 entry) and if you leave a comment telling me what your favorite main dish is to serve at your house I'll give you another entry. I am always looking for something new to serve here at The Johnson dinner table! I'll announce my winner on Tuesday, April 5th. Now you are on to Karen's side dish! I am sure you will enjoy what she has cooked up for you! Hope you are having a great time on our Fun in the Neighborhood Blog Hop! It is hard to choose just one favorite dish. I am a sucker for any kind of pasta, so I would say eggplant parmesan is #1 right now! Super cute basket, I love the accordion flower. I love your basket and the flower! I don't cook that much since I still live at home with my parents. I guess my favorite dish to cook is scrambled eggs & rice. I make it for myself because no one else likes it. The eggs and rice are cooked separately, but blended after cooking. A foreign exchange student from Indonesia taught my sister how to make it when she was in high school. I've learned how to make it since then obviously. I just became a follower of your blog! What a fun altered project! Beautiful basket! Perfect for easter! Like very much the accordion flower! My favorite dish is fish! Grilled fish with fresh vegetables! I am a follower already! bring on Spring!!!! love the basket~perfect for the kids this easter!! The basket is too cute! I am in love with the April kit! Thanks for sharing. I love all you did.The main dish inspiration look so yummy!... my fav of your creation is the basket look so pretty! Yes, I want to make that chicken dish, wow! Your little projects are so adroable with some really great details. LCOM Sketch #29 mixed with Ta Da!! !